With Original Choice, subtlety meets complexity; maturation in fresh oak wood casks imparts a perfect balance and a distinct flavor, making it the Choice of Millions. Original Choice is one of the top selling brands in India’s popular whisky segment and is one of the top 10 selling whiskies worldwide, with sales exceeding 11 million cases a year. The Original Choice Whisky blend has been carefully crafted and perfected to offer the same rich experience as that of a malt whisky, but at an affordable price. Its light malty aroma with a hint of a smooth woody character, from the use of malt spirits specifically matured in pre-identified American oak casks, has ascertained that the Original Choice Whisky experience is espoused by millions of loyalists over the years. Enjoy its distinct flavor and let the spirit of smoothness unfold gently. Original Choice Whisky celebrates every occasion with its patrons and adds that extra touch of happiness. 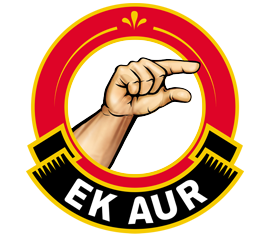 The mnemonic 'Ek Aur', is a commonly used gesture that indicates ‘one more' and stands for that extra bit more that one searches for in life and not just the extra peg! A gesture used to communicate with others as "one more". Here the mnemonic attempts to Connect on a emotional platform like Celebration ke liye ek aur, Winning ke liye ek aur, Friendship ke liye ek aur & Happiness ke liye ek aur.